I know you have a debilitating degree of pain 24 hours a day, 7 days a week, 52 weeks a year since the day you first got FM and you had growing pains since you were born. I also know you suffer from depression, anxiety, cognitive decline and a wide range of other physical ailments and have a wide range of abnormalities including NMH, alpha-delta abnormality, chairi 1 malformation, bulging disks at C5-C6 & C6-C7, a host of viruses in your body and swollen lymph nodes. Don't forget about the bounts of gastrointestinal problems, mood swings, frustrations and simply feeling no one understands you nor know what you are going through. Well what about the mass of people who just happen to not have the physical pain 24-7, 52 weeks a year, but suffer from emotional pain. I just happen to have some pain too during PMS. Want to hear about my pain? Headache, pain in either eye that may last up to 3 days or so, stiff muscles in the morning or after sitting or standing in one place for an extended period of time, transient muscle cramps in legs & arms or anywhere a muscle happens to be, painful nulling back & neck which is especially sore when I move my head. What about the increased headache when having a bowel movement? Had it, can relate. I don't have it all the time. Matter of fact never noticed it much until last PMS because didn't think about it before. You may use a pillow to sit on, I use a leg since my rear end does get sore if I sit for awhile on a hard or poorly cushoned chair. What about stiffness? I have muscles that get tight & hard. I even got a free massage from a town festivel, the massage therapist couldn't break up the hard spots in my shoulders. Pain? Nothing I couldn't handle since I knew he was trying to loosen it up which would get ride of the pain from the tight muscle from many years of accumulated stress. (That stress is another story.) I looked at it as getting a splinter out. Sure the needle hurts pricking the splinter out but it sure is worth it to get the even more painful splinter out. The finger may still hurt but not as bad. What about the other symptoms? Skin sensitive to tough? Yes sometimes during PMS but if you rub it, you get accustomed to it & the sensations decrease. I even noticed a spot on my upper arm in the shower that was a little tender. I blame it on my husband's elbow since it's about the size of an elbow and it's on my arm that is next to him when we sleep. Bladder problems? I personally take offense to the commericals of the medication for those who "got to go, got to go". I may "go" then 5 minutes later (or less) have to "go" again. Diarrhea? Hey, once it clears out there isn't anything else left to come out. Stomach nauseated, gastro reflux? Been there, can relate. Sleeping problems. This I have to confess I don't have this problem that often. 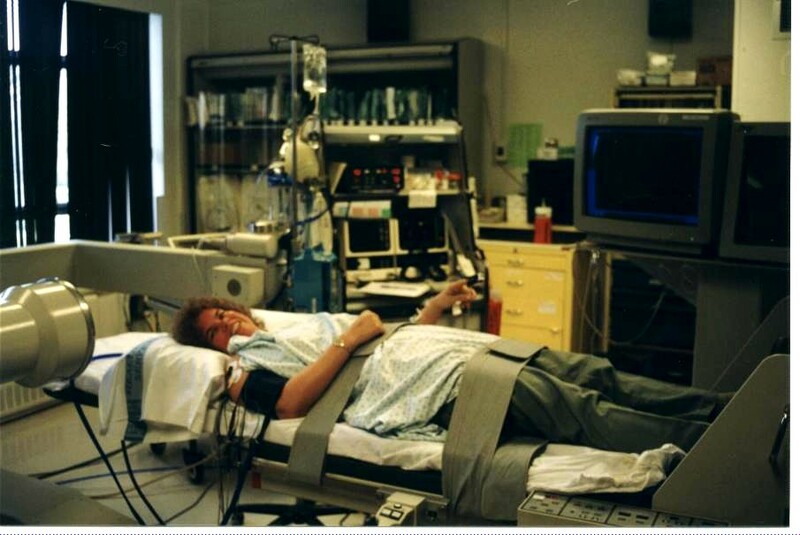 I do happen to have alpha-delta abnormality, even had it when slept like a log all night the 3rd night in a sleep lab. Does pain increase alpha waves? Not a dull migraine I happened to have last January the 2nd night in the sleep lab. There was no more alpha waves than the night before when I had no pain. However I, as well as just about everyone does have an occasional night's poor sleep due to problems, stress, temperature too hot or cold, traveling (jet-lag, poor hotel bed, ect. ), and the list could go on. What about cognitive problems? I've met several people with FM who could carry on a conversation with distractions going around, while I loose my trend of throught. I have documented processing information problems, information just doesn't get into the memory banks to pull out information, problems with remembering facts and details. (That's why I didn't name the drug above that is advertised on TV for overactive bladders.) Recognizing faces? Dr. Mordoresi who did the neuropsychological can tell you I am at a disadvantage here. LD? ADHD symptoms? Performance IQ around 122, Verbal IQ around 106 (that range indicates a difference in functioning which does lead to it's occasional frustrations) most of the time I'm OK with this. I do take Adderall, Cytomel & Mind Set (neurotransmitter precursers) for the cognitive problems. Get frustrated with cognitive problems? Is mine old age? I'm 40. This problems started about 3-4 years ago. Matter fact in the first twin study the psychologist doing the psychologicals told me he expected had thought I would have done better on the tests considering my education (master's degree). What about NMH? According to the twin study I along with 3 healthy twins & 4 "sick" twins had NMH. My blood pressure dropped to 60/32. I can tell people what symptoms occure when the BP drops that low. Residual effect afterwards. We can compare symptoms if you want. What about the other abnormalities? I happen to have my brain coming down some in my spinal cord & have a narrow spot in the spinal fluid. Bulging disks? I saw them on the MRI. It only acts up during hormonal changes or occasional weather changes or extreme stress. A couple of excederine migraines works well. Do I have FM? NO. Do I have some "tender points"? I had some when I was at the twin study. Does FM folks have all these symptoms to themselves? Well do alcoholics & addicts have all the negative emotions & problems? NO. I admit I don't have FM nor CFS but at times I do have symptoms & can relate. How do people feel a part of a group? They feel acceptance & belonging. When you tell me I don't understand and my cognitive problems aren't as bad, you are belittleing my feelings. You are telling me my feelings and struggles are not significant. You have your sense of reality which is how you preceive experiences. Well I have my feelings & preceptions too. When I see you talking to another FMer and I have to move away with the person I'm talking too because I can't concentrate then you tell me your cognitive problems are worse & mine is just "age" when I'm younger than you. What am I to think. Think about it. Who is unable to carry on the conversation? Who had to move? You say you have dementia? Are you a doctor to minimize my problems or symptoms? You want me to be there to understand and support you, but when I face similar struggles you minimize my symptoms & problems. How does this make me feel? What do you want me to do? Why do you shut me out? Why do you minimize my concerns? Why aren't you there for me & encourage me? All I ask for is to understand and accept my struggles & feelings. Don't immediately assume all "healthy" people look at you and think "It's all in your head". Don't belittle my feelings and frustrations. Validate my feelings and share what you have found helpful with me. Don't shut me out. I have done a lot to try to help you. I prayed for you many times. I try to put my feelings aside to help you. Now I need you to be there for me. I need to feel a part of the group. I want us to help each other and look at similarities and things in common. I don't want you to compare symptoms. You handle your symptoms, I handle mine. Sometimes we need extra emotional support. Right now I need some emotional support. I have emotions too & need your prayers & support as I go through my struggles. Why? Well for women, we may be starting peri-menopause. It improves at the other end. The Brain Place the link to the article is gone but you can find other interesting things on the site. Limbic System Hyperactivity "The limbic system lies near the center of the brain. It is about the size of a walnut. This is the part of the brain that sets a person's emotional tone or how positive or negative you are. The limbic system also affects motivation and drive. It helps get you going in the morning and encourages you to move throughout the day. It controls the sleep and appetite cycles of the body. It affects the bonding mechanism that enables you to connect with other people on a social level; your ability to do this successfully in turn influences your moods. Mood problems often occur when the limbic system of the brain is overactive. Clinical depression, manic-depressive disorder and severe PMS are more severe problems than the garden variety most people experience in the form of bad moods. For complete healing to take place, the addition of antidepressant medication or appropriate herbal treatment may be needed. A sure sign that the prescribed medications are really treating the depression is that the deep limbic system activity normalizes. Whenever limbic activity normalizes, there is a corresponding decrease in the patient's symptoms. Low norepinephrine and dopamine levels are often associated with depression, lethargy, trouble focusing, negativity and mental fuzziness. SAMe is involved with the production of many important brain compounds, such as neurotransmitters. It donates "methyl" groups to these compounds so that they can function properly. Normally, the brain manufactures all the SAMe it needs from the amino acid methionine. In depression, however, this synthesis has been found to be impaired. Supplementing the diet with SAMe has been found to increase the neurotransmitters involved with depression and improve cell membrane fluidity. SAMe is one of the best natural antidepressants, a number of recent studies have shown that it is as effective as antidepressant medication. SAMe has also been found helpful for people who suffer from fibromyalgia, a chronic muscle pain disorder. Fibromyalgia and ADD run commonly together. I think the chronic stress associated with ADD is in part responsible for the muscle pain. People who have bipolar disorder or manic-depressive illness should not take SAMe. There have been a number of reported cases of SAMe causing manic or hypomanic episodes (excessively up or happy moods, extreme impulsivity in sexuality or spending money, pressured speech, or decreased need for sleep). I think these reports highlight that SAMe is an effective antidepressant, as all of the prescription antidepressants have that capability as well." Site by Daniel G. Amen, MD who has "been involved in brain imaging research for the past 13 years, pretty much on a daily basis. First with sophisticated quantitative EEG (brainwave) studies, and in the last 10 years with a nuclear medicine brain study called SPECT (single photon emission computed tomography) which measures cerebral blood flow and metabolic activity patterns. This journey has been both exhilarating and frustrating. Exhilarating because through these studies scientists are now able to see brain patterns that correlate with behavior never before seen, such as tendencies toward violence, depression, anxiety, distractibility, and obsessiveness. The visual evidence of phenomena mostly thought of as "psychological" has revolutionized the way physicians can help patients. We have more information to make more effective treatment decisions. We can show patients and their families the physical "brain" evidence of problems, helping them to be more accepting and compliant with treatment. And we use the information from this research to educate the public on the effects of drug abuse, head injuries and "even negative thinking" on the brain. This has been truly an amazing time."